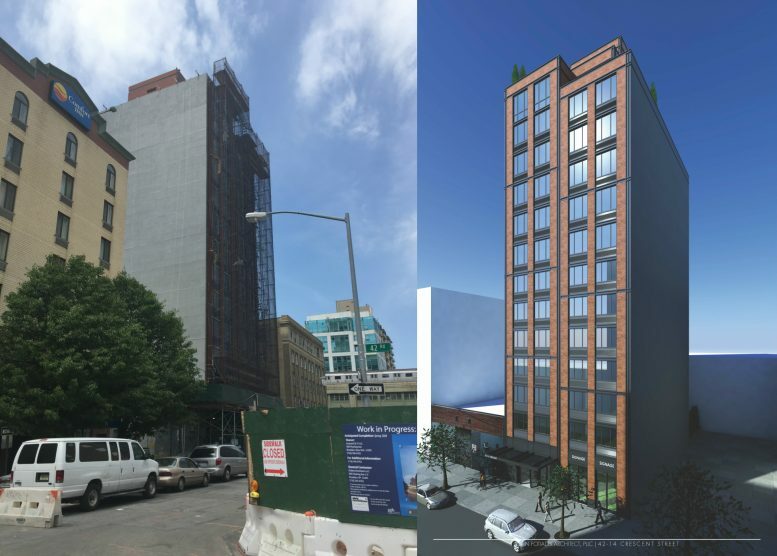 Construction is wrapping up on the 13-story, 48-unit residential building under development at 42-14 Crescent Street, in the Court Square/Queens Plaza section of Long Island City. The structure’s exterior and façade elements have now been installed, as seen in a photo posted to the YIMBY Forums by JC_Heights. The building measures 44,061 square feet and its residential units, which will be rental apartments, should average 816 square feet apiece. It will also contain 740 square feet of ground-floor retail space. Amenities include private residential storage units, storage for 23 bikes, laundry facilities, a fitness center, indoor and outdoor recreational areas on the ground floor, and a rooftop deck. Meadow Partners is the developer, while John Fotiadis Architect is behind the design. It was only in February that the project topped out. Occupancy is likely within the next few months.